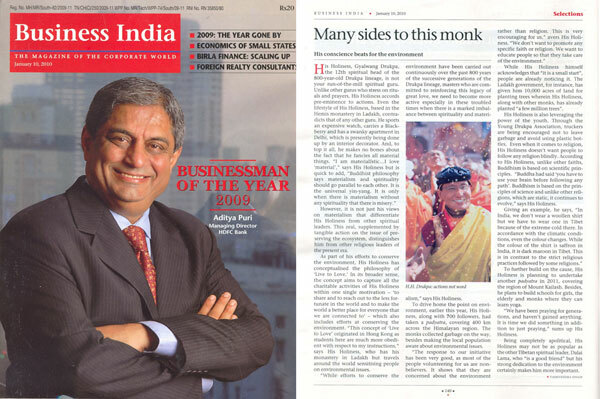 This fabulous coverage, authored by Yashvendra Singh, has appeared in one of the leading business magazines in India, Business India titled "Many sides to this Monk". 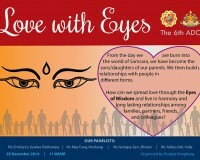 This incisive and genial article has been generated as a result of the interview with His Holiness the Gyalwang Drukpa in Hong Kong. The article lays stress on Drukpa Lineage and His Holiness work for the preservation of environment. Click here to download a copy of the article in PDF format. His concience beats for the environment. His Holiness, the Gyalwang Drukpa, the 12th spiritual head of the 800-year-old Drukpa Lineage, is not your run-of-the-mill spiritual guru. Unlike other gurus who stress on rituals and prayers, His Holiness accords pre-eminence to actions. Even the lifestyle of His Holiness, based in the Hemis monastery in Ladakh, contradicts that of any other guru. He sports an expensive watch, carries a Blackberry and has a swanky apartment in Delhi, which is presently being done up by an interior decorator. And, to top it all, he makes no bones about the fact that he fancies all material things. "I am materialistic... I love 'material'," says His Holiness but is quick to add, "Buddhist philosophy says materialism and spirituality should go parallel to each other. It is the universal yin-yang. It is only when there is materialsim without any spirituality that there is misery." 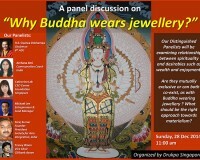 However, it is not just his views on materialism that differentiate His Holiness from other spiritual leaders. This zeal, supplemented by tangible action on the issue of preserving the ecosystem, distinguishes him from other religious leaders of the present era. As part of his efforts to conserve the environment, His Holiness has conceptualized the philosophy of "Live to Love". In its broader sense, the concept aims to capture all the charitable activities of His Holiness within one single motivation - 'to share and to reach out to the less-fortunate in the world and to make the world a better place for everyone that we are connected to' - which also includes efforts at conserving the environment. "This concept of 'Live to Love' orignated in Hong Kong as students here are much more obedient with respect to my instructions," says His Holiness, who has his monastery in Ladakh but travels around the world sensitizing people on environmental issues. "While efforts to conserve the environment have been carried out continuously over the past 800 years of the successive generations of the Drukpa Lineage, masters who are committed to reinforcing the legacy of great love, we need to become more active especially in these troubled times when there is a marked imbalance between spirituality and materialism," says His Holiness. To drive home the point on environment earlier this year, His Holiness along with 700 followers, had taken a padyatra, covering 400km across the Himalayan region. The monks collected garbage on the way, besides making the local population aware about environmental issues. "The response to our initiative has been very good, as most of the people volunteering for us are non-believers. It shows that they are concerned about the environment rather than religion. This is very encouraging for us," says His Holiness. "We don't want to promote any specific faith or religion. We want to educate people so that they take care of the environment." While His Holiness himself acknowledges that "it is a small start", people are already noticing it. The Ladakh government, for instance, has given him 10,000 acres of land for planting trees wherein His Holiness, along with other monks, has already planted "a few million trees". His Holiness is also leveraging the power of the youth. Through the Young Drukpa Association, truckers are being encouraged not to leave garbage and avoid using plastic bottles. Even when it comes to religion, His Holiness doesn't want people to follow any religion blindly. 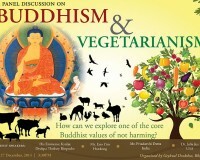 According to His Holiness, unlike other faiths, Buddhism is based on scientific principles. "Buddha had said 'you have to use your brain before following any path'. Buddhism is based on the principles of science and unlike other religions, which are static, it continues to evolve," says His Holiness. Giving an example, he says, "In India, we dont' wear a woollen shirt but we have to wear one in Tibet because of the extreme cold there. In accordance with the climatic conditions, even the color changes. While the color of the shirt is saffron in India, it is dark maroon in Tibet. This is in contrast to the strict religious practices followed by some religions." To further build on the cause, His Holiness is planning to undertake another padyatra in 2011, covering the region of Mount Kailash. 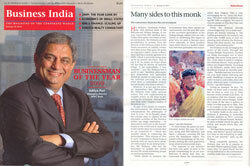 Besides, he plans to build schools for girls, the elderly and monks where they can learn yoga. "We have been praying for generations, and haven't gained anything. It is time we do something addition to just praying," sums up His Holiness. Being completely apolitical, His Holiness may not as popular as the other Tibetan spiritual leader, Dalai Lama, who "is a good friend", but his strong dedication to the environment certainly makes him more important.